I'm trying something new today that I'm hoping will become a semi-regular feature. Fair warning: There's at least a 50% chance that I'll get lazy and forget to do this ever again. But let's give it a shot and see where it goes. One of my favorite developments of the past few months is the growing hockey humor community that's slowly but surely sprouting online. I'm going to try to take some time every few weeks to highlight some of the posts that I think DGB readers would enjoy. Ideally I'll get the satisfaction of knowing I've temporarily damaged your Friday morning productivity, and you'll wind up with some new sites in your rotation. Blades of Funny - This relatively new site takes a moment to say goodbye to some departing stars. Leaf fans can only hope they're right about that last one. Bourne's Blog - A look at various NHL players' summer jobs. They had me at the first line. Don't Trade Vinny - The world's most popular Tampa Bay Lightning humor blog has been a longtime critic of Rick Tocchet. With his firing this week, it was only fair of them to take a moment to say goodbye. Habs Laugh - The scouting report on how the Habs can beat the Caps. As if any such thing was remotely possible. 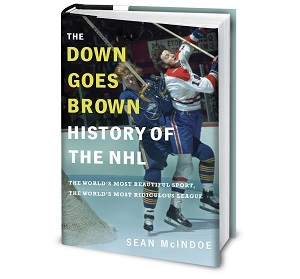 Intent to Blow - The NHL's answer to The Onion reveals a shocking scandal surrounding the Vancouver Canucks. Yes, of course there's a 'Kyle Wellwood Is Fat' joke, why do you ask? Sports Pickle - Well, technically this is NFL humor. But something tells me DGB readers will enjoy it. Bloge Salming - On the one hand, I have to assume that anyone who reads and even vaguely enjoys DGB is already visiting Bloge daily. On the other hand, even if you've already seen it this one is brilliant enough to deserve another look. Hilarious round-up, and as a Rangers fan, I need it! But Sports Pickle owes you a beer or at least a shout-out. Good, but not great. You are still the master. I love you. It was pretty good I must say. Those other sites aren't as funny as this one. Did anyone else notice that in the video when Wellwood was doing the numa numa dance the hands were backwards. Kinda made my day right there. Rick Naststley is the greatest thing in the history of music. Fair warning: There's at least a 50% chance that I'll get lazy and forget to do this ever again. Does this mean you're not going to get drunk and complain about players that point to the puck over the glass again? Soooooooo this is where all the people that read newspapers went after cancelling their subscriptions. The head of Canwest Global would like to have a word with you, sir. Thanks for the plug and the massive traffic! I can't believe that football site fleeced you so bad! I hope you get some kind of kickback. Otherwise knees may have to be broken. Thanks for the plug, sir! It's awesome to be in such great company. I read sportspickle a lot, it's pretty funny although they rely on the term douchebag a bit too much. When I saw that flow chart I wondered if you had made a guest appearance writing there or something, but your NHL one was better. Heyyy, I'll chime in with my fellow plugee's too. It's an honor to be in such company. Sooo.... we're all rich now, right?